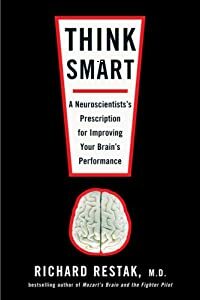 I’ve been reading Richard Restak‘s Think Smart: A Neuroscientist’s Prescription for Improving Your Brain’s Performance – actually, listening to the book on CD from the library. I hoped it would be filled with tips I could pass along to my first year students, but find that it’s telling me about my aging brain and what I can do to avoid dementia. So it’s kept my attention even though it didn’t meet my original need. At the same time, I started a class in Digital Drawing and Painting. This is a tremendous stretch for me. The last time I drew anything was third grade. My Mom showed me how to draw a horse – at the time, I was completely obsessed with horses, even though I had never really seen or taken care of one. I remember turning in homework papers filled with horses in the margins – whenever my attention would flag, I’d draw a horse. There was a problem, though. My Mom was not really an artist, and she only knew one way to draw a horse. Whether I was afraid of drawing something unrecognizable or simply lacked imagination, I never tried any other way of drawing a horse. Aside from that one view of a horse, I entered adult life with the same drawing skills I had in kindergarten. When I was taking Digital Photography from Victoria Hutson at Lake Superior College a few years ago, I saw the work turned out by her Digital Drawing students. I was amazed at the beauty! When the opportunity arose to learn digital drawing from her, I leapt at the opportunity – forgetting that I couldn’t really color inside the lines. If I could learn “digital” photography, could “digital” drawing so very different? Just a week into the course, we are learning basic shading techniques. In the videos that Victoria Hutson prepared, it looks very easy. We can’t see her hand, but the tip of her digital pen waves over the object and the shading fills in evenly and magically. “I can do that!” I think. But when I wave my digital pen over the tablet, sharp edges and uneven shades appear. Where she draws beautiful spheres, I draw mutant oranges and defective soccer balls. Dr. Richard Restak, the neuroscientist, comes to my rescue. It’s all a matter of synaptic pruning, he says. All of my adult life, my brain has been actively pruning away any unused synapses to speed up the activities that I do often. The connections for typing quickly – something I’ve used everyday – are well-worn pathways. But any synapses related to controlling a pencil to create a picture? Long since pruned away, even those for my one view of a horse. The Bible is full of figures who lament that God is asking something new and difficult of them in their old age. It’s like that every time I attempt my Digital Drawing homework. “Why am I trying this?” I wail, followed by “I could still back out.” But something deep inside wants to keep trying. Dr. Restak implies that it’s not too late to lay down new neural pathways – it just takes much more practice to convince those synapses, pruned so long ago, that my brain wants to be “smarter” about something it abandoned so long ago. Sleep will help, he says, because we practice in our sleep what we do during the day. Just how much can an already-mature brain learn? Dr. Restak waffles. We’ll see. Next What Could I Have Done in Your Class?